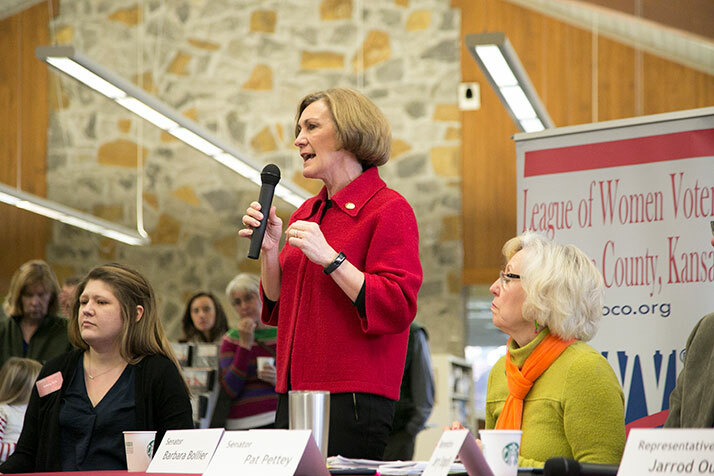 Sen. Barbara Bollier was removed as vice chair of the Senate Public Health and Welfare Committee after endorsing a Democrat in the Congressional race. Republican Sen. Barbara Bollier, whose stances on Medicaid expansion, gun control and other issues have aggravated more conservative members of her party for years, was removed as vice chair of the Senate Public Health and Welfare Committee following her endorsement of a Democrat in the local Congressional race. Bollier announced Wednesday she was supporting teacher Tom Niermann’s bid for Congress, saying she did not believe incumbent Republican Kevin Yoder had represented the views of the district and that as a constituent she had been frustrated by his lack of town halls. She also said she would support Democratic Sen. Laura Kelly in her bid for governor should Kelly win her party’s nomination. Those moves prompted swift rebuke from Republican statehouse leaders. Senate President Susan Wagle and Majority Leader Jim Denning, whose district abuts Bollier’s, issued a statement condemning her for crossing party lines. “After Senator Bollier’s embarrassing endorsements, I have no choice but to remove her from her leadership position, effective immediately,” Wagle said. For her part, Bollier told the Topeka Capital-Journal she would consider leaving the Republican party, and that she may look to join the new Party of the Center or become an independent.